Most hunters I know just don’t know what to do with wild turkey legs. It’s true— these legs are tough, especially from a dominant, old tom turkey, and the pin bones can be intimidating to cook. 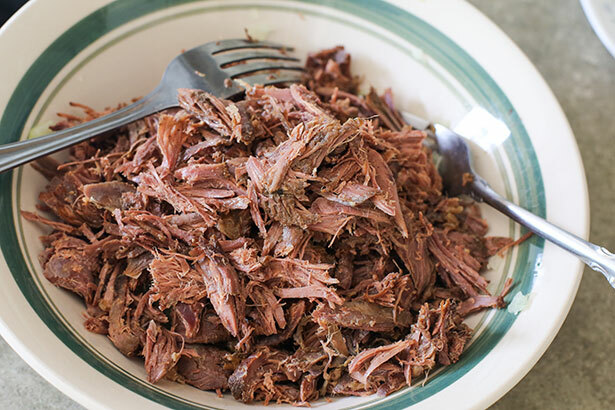 For this reason, these underrated parts are often thrown away, and that’s a shame because that’s a ton of meat wasted; from just two turkey leg and thighs, I was able to make about 25 tacos for this recipe. And just because turkey may be considered a “white meat,” don’t be fooled. Wild animals are a different and their leg meat is dark and flavorful. However, you do have to put in some work to make them fit for the table. If you have a slow cooker, then you can cook turkey legs. It’s as easy as seasoning the legs and throwing it into the crockpot for a few hours to tenderize—no more difficult than slow cooking a roast. After 6 to 8 hours, the meat will be so tender that you can do anything with it. 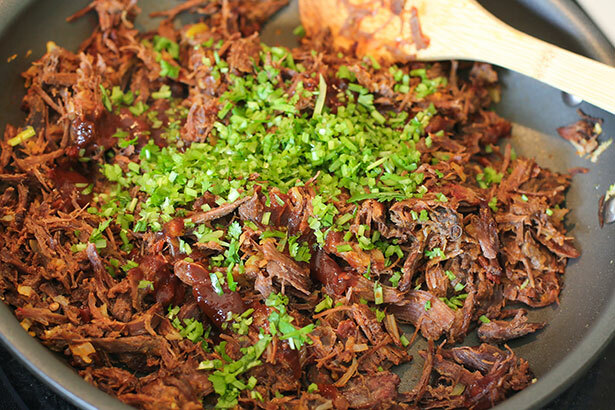 Use the meat in your favorite casseroles, soups, stir fries, BBQ sandwiches … or tacos. These turkey and chipotle fried tacos are by no means healthy, but I promise that they will be gobbled up so quickly. Remember those fast food Jack in the Box or Burger King fried tacos? They were filled with a weird meat paste that was so disgusting but also so addicting at the same time. 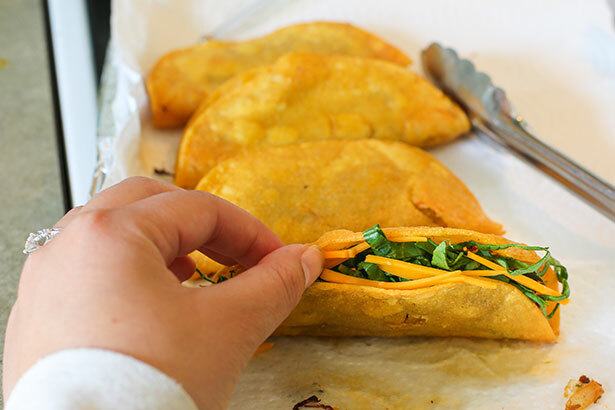 Well, these tacos are all crunchy, greasy goodness—filled with wholesome ingredients hunted by you. 1. Remove thick areas of silver skin from turkey—no need to get all of it. Combine minced garlic, 1 tablespoon of salt, cracked pepper, chili powder and cumin, and then rub it all over turkey. Place turkey in a slow cooker and pour in enough beer to completely submerge turkey. Add halved onion and cover the slow cooker with foil. Place the lid on top of the foil—foil will help keep moisture in. Cook on low for 6-8 hours or until meat is tender. Remove meat from bones and finely shred with two forks, being careful to remove all pin bones. 3. In a cast iron skillet, heat 1 to 2 teaspoons of vegetable/corn oil over medium heat. 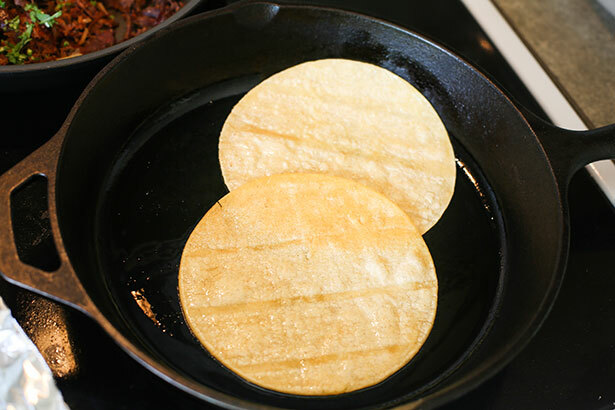 Lay corn tortillas into the warm oil and flip back and forth to warm through. (Warming the tortillas in oil helps to moisten the tortilla and prevents it from cracking when assembling with meat.) Lay warmed tortillas in a bowl and keep warm. Add more oil to the pan as necessary. 5. 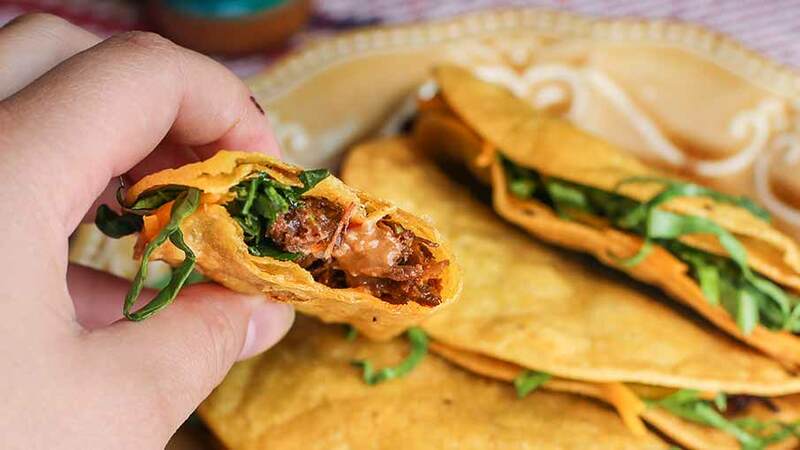 In a cast iron skillet, heat enough oil to 350 degrees F to shallow fry tacos—do not fill your cooking vessel more than 1/3 of the way up to prevent oil from boiling over. 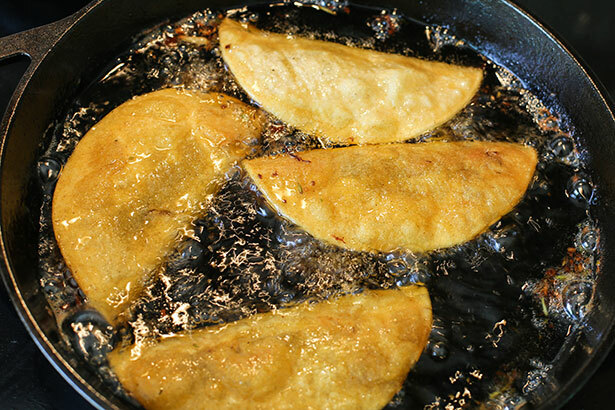 Once oil is heated, gently lay cold tacos into the oil and fry for 2 to 3 minutes on both sides; do not overcrowd the pan and be careful for splatter. 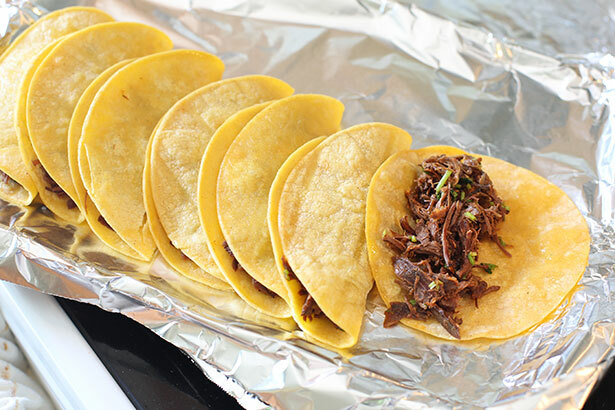 Remove the fried tacos with tongs and tip to drain out excess oil—there will be lots. Rest on paper towels. 6. Once tacos are cool enough to handle, carefully open up the tacos and fill with shredded romaine lettuce and cheddar cheese. Serve with your favorite hot sauce.